"Without pictures, it's just a story"
The Bite Switch is Conceptus' original mouth-operated shutter release. It is the favorite of freeflyers and photographers of other skydiving disciplines who need a simple, intuitive, hands-free camera shutter release switch. It utilizes a very gentle bite to operate the camera and is extremely easy to use. It can be used with any camera equipped with a remote shutter release jack. The supplied plug fits most Canon film cameras – others cameras usually require custom connection, which you can find detailed instructions for on the Connection page. The Bite Switch is comprised of a durable, sealed tubular switch assembly measuring 1.5 inches long by 1/4 inch diameter, a 36 inch coaxial wire, and a 2.5mm plug with a 90 degree elbow bend. 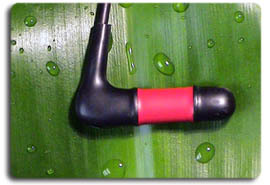 During use, the switch is placed in the mouth with the wire pointing either to the right or left. Biting anywhere on the red section ("bite zone") actuates the switch and triggers the camera. There are two tactile ribs so the user can instantly feel the bite zone with their teeth and lips. The required bite force is about what it would take to bite through a small carrot, or about how hard the average person can comfortably bite on their own finger without pain. The actual depression of the switch mechanism is only about 1/8", so very little jaw movement is needed. As a result, helmet motion is extremely small. Be aware the Bite Switch works best when used with open-faced helmets or helmets with chin cups allowing the user to open and close the mouth at least to a small degree. It should always be bitten only with the front teeth, not with the sharp canine teeth, and only hard enough to slightly flatten the tubular portion. Usage otherwise may deform the internal components or puncture the flexible casing and cause a malfunction.